The first boats answering Bob Geldof's call to ferry people from France for the G8 protests have arrived. Four boats from the south coast had reached Cherbourg by Saturday night. But the crews were disappointed to find no French protesters waiting to be ferried back to England to travel on to Scotland ahead of the G8 meeting. 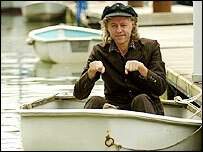 Bob Geldof is due to be in Portsmouth on Sunday to welcome back the yachts. Sail 8 is part of the Live 8 bid to get world leaders to tackle poverty. The first boat to arrive in Cherbourg was the Supertaff from Gosport, skippered by Luke Windell and owned by Neil and Mandy Chapman. Mr Windell said: "It is a good cause and a good excuse to go across the channel, which is always a good sail. [Live 8] is definitely going to have an effect." Trina Innes, co-ordinating the action in Cherbourg, said 75 skippers had registered boats to sail across but poor weather conditions meant that only five had made the trip to France by Saturday night. Coastguards had reported south-westerly winds making choppy conditions in the Channel. The Maritime and Coastguard Agency has issued safety guidance for would-be mariners. It urged inexperienced sailors and people with boats inappropriate for a Channel crossing to give their support from the shore, rather than attempting to cross one of the busiest shipping lanes in the world.